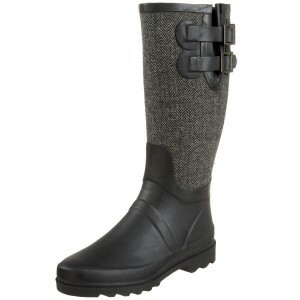 Chooka galoshes are some of the most popular rain boots sold today. Zany, edgy, Chooka rain boots have been called THE outfit rather than an accessory to an outfit. According to Chooka, the one ‘tame’ world of rain boots has been changed forever by their wildly whimsical designs. In the beginning, Chooka galoshes made waves with polka dots and simple, bright colors. However, they moved on quickly to include lots of fresh designs. These designs ran from leopard print to tattoo. Chooka galoshes are also no longer a rain only boot. In fact, people wear Chooka rain boots today in any weather because of the array of dazzling colors and designs. However, design is not the end all be all with Chooka. People love Chooka because the company has proven that form and function need not come at the price of style. That’s right, Chooka galoshes are AFFORDABLE. Many of these trend-setting styles are available for $40 or less. Steep for a standard rain boot maybe, but not for a work of art! The whole ‘utility can be beautiful’ concept began at with a small, Seattle based company. CEO Rob Moehring, a third generation company head, decided to take a risk with his family company. Chooka has come a long way. Proudly establishing itself as number one in fashion rain gear today, Chooka galoshes are known for fresh and young designs. In fact, every single season, the rain boot is reinvented by Chooka. Looking for a beautiful, unique, stylish boot to wear in AND out of rain? Try Chooka galoshes!